Freshwater quality was assessed at 172 sites on select rivers throughout 16 of Canada’s drainage regions where human activity is most intensive using the Canadian Council of Ministers of the Environment’s Water Quality Index. Source: CICH graphic created using data adapted from data assembled by Environment Canada from federal, provincial, territorial and joint water quality monitoring programs. 2010 to 2012.
https://www.ec.gc.ca/indicateurs-indicators/default.asp?lang=En&n=68DE8F72-1 – accessed March 12th, 2017. 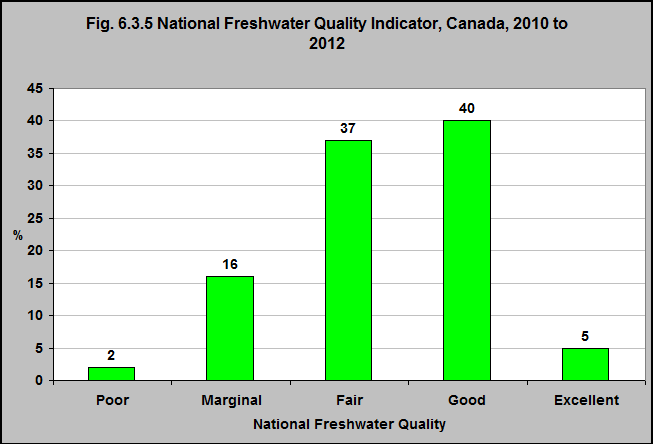 The quality of fresh water varies naturally in Canada. This is due to Canada’s diversity of geology and climate. The development of land around rivers and lakes also affects the quality of fresh water. The Government of Canada monitors the quality of fresh water at 172 stations across the country. For the period 2010 to 2012, 45% of the monitoring stations reported that the water was of excellent or good quality. 18% reported that it was of poor or marginal quality.